Juerg is about to wrap up his first batch of experiments and I've asked him whether he could post a short summary of his endeavors. "The Fiji Bull Shark Tagging Program is in its fifth season. What started with a few pop-up satellite tags in 2004 is now a much broader research project aiming at understanding Bull Shark Behavior and Ecology. To summarize the first 2008 field season (January to March): it has been spectacular and highly satisfying! We've collected lots and lots of data, done spectacular dives, the Sharks have been very well "behaved" and best of all: we learn more and more about these fascinating predators! So far, we have deployed more than two dozens acoustic tags and a state-of-the-art miniaturized pop-up satellite tag. Sharks equipped with Acoustic Tags will give us presence/absence data. Whenever a tagged shark comes into detection range of a so called underwater listening station (receiver), it will be picked up and we will know what individual was there at what time of the day. Some of those tags also tell us the temperature inside the shark’s stomach - any guess what that could be? The bulk of these tags has been hand-fed, mostly to Bull Sharks. This is for sure the least invasive technique and Rusi has proven his usual mastery in ensuring that they were placed with the correct individual Sharks. The downside of this technique is that the tags will only stay in for a few days to maybe a few weeks, but we are able to collect some very valuable data never the less. In addition, we have attached a few acoustic tags externally and those will hopefully stay on the Sharks for much longer and keep us informed on how often and how long they visit Shark Reef and other reefs during the year. For instance, we tagged Bumphead externally on February 23rd. That didn't seem to stress her at all and she hung around for a few days before going walkabout. Yesterday, she turned up with the tags still properly attached. Where did she go? 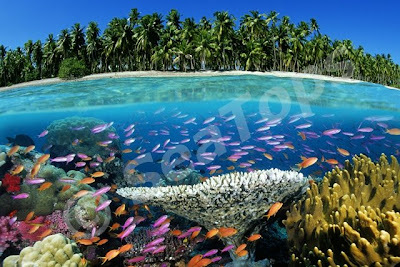 Hopefully, the receivers placed on the other reefs will tell us. 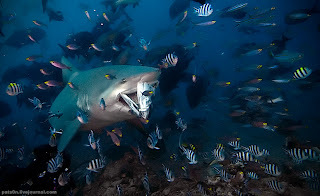 But it certainly shows that most probably, the Bull Sharks do not spend all their time on Shark Reef but wander around, sometimes for weeks or even months at a time. Here, Pop-up Satellite Tags could tell us more. These tags collect temperature, depth and location data for a preset time interval. After that, the tags detach from the animal, float to the surface where they establish a link to a satellite to which they download the data - and we will eventually get an e-mail message ‘from the Shark’ telling us where it has been and what it has done! Well, of course it’s not quite that easy and and the data require a lot of analysis before we can safely say what has happened. But for sure, it’s exciting. The satellite tag we have deployed this year is due to pop up sometimes next week. So keep your fingers crossed that all goes well! Besides these ‘technical’ approaches, we have also collected Observational Data, for example, who is feeding and how many times, who does not feed and just hangs out with its mates, plus how do the different shark species on Shark Reef interact with each other. Altogether, we are getting to know our beloved beasts better and better! So next time you visit Shark Reef Marine Reserve, keep looking out for a tagged animal. Thank you Juerg and Moce Mada! No, you got me completely wrong: it is us who is BAD! This is just a short post to alert our US friends to the airing of "Shark God", a documentary that David Ireland, the Wildlife Man, has filmed with us in 2007. It will be shown on Discovery's High Definition Channel (hence not the "normal" Discovery Channel) on 17/4/08 at 8pm and at 11pm, on the 18/4/08 at 3am and 4pm and again on 19/4/08 at 10am EST. Judging from his toothy website featuring a vast array of death-defying encounters with -to name but a few- ferocious Reptilians, angry Rhino and killer Boars and of course, giant and mostly lethal Marine Monsters, David seems to be quite a character. And lucky, too!!! Once again, he doesn't disappoint, as, and I cite: "Sea God" is arguably the most extreme shark film ever produced and one of the " Wildlife Man`s" greatest achievements." Actually, the Staff tell me that they very much enjoyed the man and the shoot and that David is really a very nice, mellow and professional bloke with a passion for Shark Conservation. Did the Shark God Dakuwaqa drag him down to an untimely, and watery death, I hear you ask with bated breath? Of course, ah aint telling! It has taken weeks of cajoling and subservient supplication - but the Hawaii Dream Team have finally agreed to roll out the Results of last month's Fish Count. They however ask me to include the caveat that this is work in progress that may remain in a state of change. Obviously further research is required at SRMR to fully assess the faunal diversity. Considering the constraints of observer time and survey methods utilized, the 381 fish species recorded during a brief window of time in a limited area is an impressive number and indicative of a rich and diverse fish fauna. 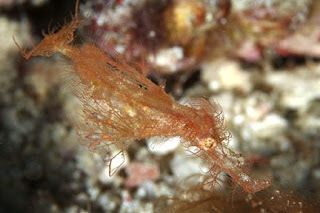 Besides featuring several Range Extensions and very possibly, some new Undescribed Species, the List is a treasure trove of supplemental information that can be accessed by clicking on the small links in the lower right corner of the pictures. Having promised not to embarrass John with further accolades, I must however insist in commending Rob Whitton for setting up a phenomenal, instructive and user-friendly website - way, way better than we could have ever imagined or hoped for! We all are obviously incredibly proud and unendingly thankful. Guys, from the bottom of our hearts, Vinaka Vakalevu! Our friend Michael Patrick O'Neill has just won the Science/Natural History section of the 65th Pictures of the Year International contest. 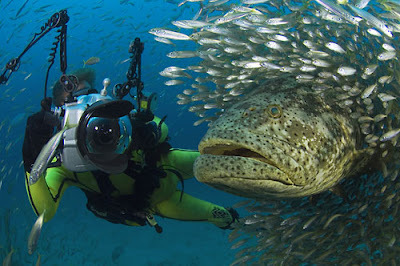 The stunning winning picture depicts a Goliath Grouper (Epinephelus itajara). Formerly known as Jewfish , it is recognized as a critically endangered species by the World Conservation Union owing to its relentless pursuit by fishermen and trophy hunters. After the USA and the Carribean began protecting it in the 90s, it is staging a tenuous comeback, however with the fish's slow growth rate it will take some time for those populations to return to their previous levels. After our Giant, or Queensland Grouper (Epinephelus lanceolatus), this is one of the largest Bony Fish found in Coral Reefs (the largest Bony Fish being the Ocean Sunfish and the largest Fish being the Whale Shark). Of interest, both Groupers are believed to be protogynous hermaphrodites, with all young starting out as females and only a few large individuals becoming males. To the discerning Sharkaholics, male Silvertip Sharks are somewhat of a Holy Grail. Having dived many of the iconic Silvertip spots from the Burma Banks to Valeries' Reef to Avatoru Pass, I've only ever seen one, a tiny sub-adult hovering above Silverado Rock in Cocos Island. People in the know tell me that whereas the big females are resident, the males are transient and also prefer much deeper water, well below recreational diving depths. Same for Shark Reef: so far, Madonna, Joker, Lady and the other Silvertips have all been females - so imagine my surprise and excitement when this lil cocky fella came dashing into the Arena! Did he only turn up for a quickie or will he make a Commitment and hang around? Men being men, only time will tell - but he's been back again, as documented by the above picture. And who is the lucky, and talented photographer, I hear you ask? my friend Karen Varndell of Dive Vava'u! I think it's great that the Bold and the Toothy have a place in her heart as well! Fingers crossed that our very first male Silvertip will become a regular and thus warrant an own name.